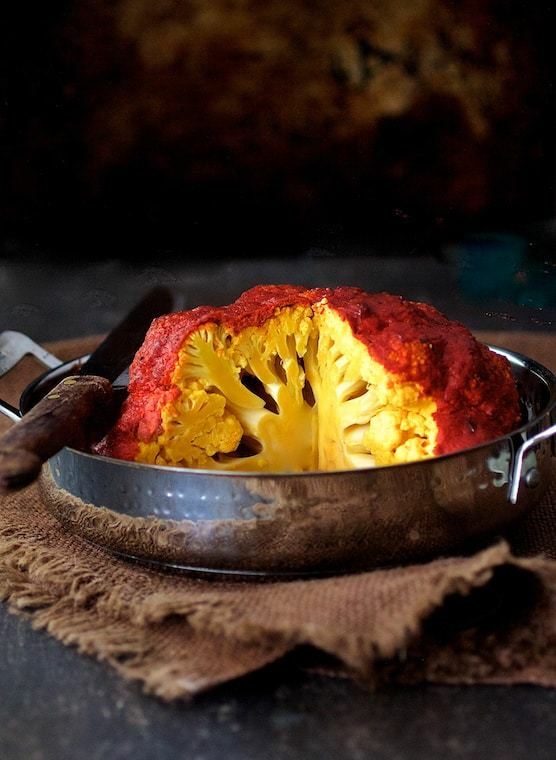 Brined first, this Whole Roasted Tandoori Cauliflower is flavorful throughout! Fill a large bowl with hot tap water. Add the salt and swish it around until it dissolves. Let the water cool to room temperature. Submerge the cauliflower in the brine and refrigerate 24-48 hours. Preheat oven to 375 degrees. Lightly oil a baking or roasting dish. Drain the cauliflower, pat dry and place in baking dish. Combine yogurt, olive oil, tandoori seasoning, ginger, cayenne, and salt and black pepper to taste. Coat the cauliflower with the yogurt mixture. Bake for 45 minutes to 1 hour or until a knife can be easily inserted. Serve immediately.